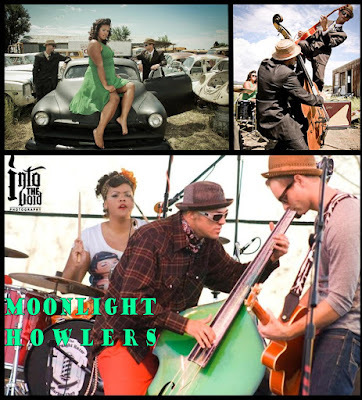 The Moonlight Howlers are a seriously hard-working, young, talented, trio out of Arizona. The band is made-up of Composer and amazing Stand-up Slap Bassist Raffael Weatherly, aka "Bones", aka Raffe (Male 23), Drummer and Singer Aeriel Weatherly, aka "Siren", aka Ari (Female 21), and Guitarist and Singer Tory Putman, aka "Lee Terror" (Male 27). The band all has two things in common: they have names that could be super heroes in a comic book, and they are family. I saw the Howlers on a really cold wet night in November of 2010 in Portland, Oregon, and immediately loved their music and danced all night to it. 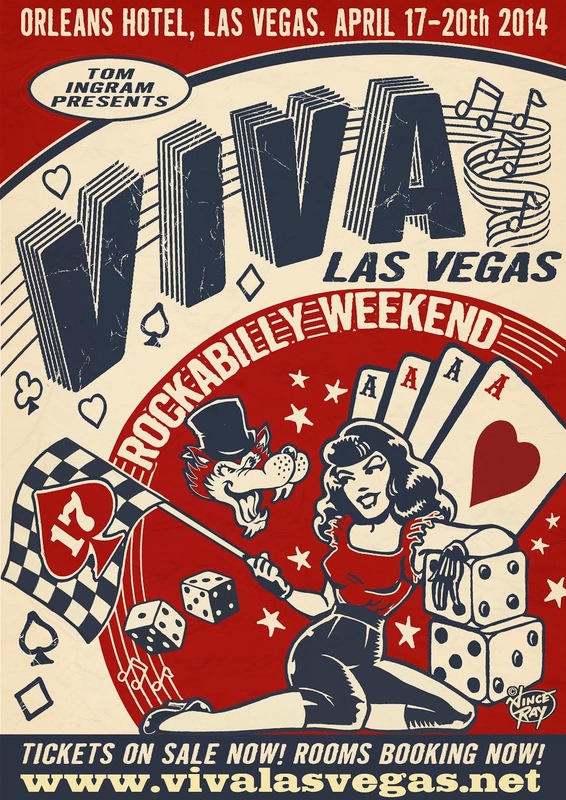 I recently missed their appearance at Viva Las Vegas Rockabilly Festival 15, but saw Raffael at Viva in the hall, and requested an interview once the band returned home, by phone. I had been corresponding with his Mom ever since I filmed a candid video for them to capture their live show in Portland. FT: When was the band formed and how did it become all family? guitarist and drummer. We played in the garage and around the house for about two years. and we've been doing this for about three years professionally now. FT: So Raffael, you're the band leader? FT: So since I saw you on tour in Portland circa 2010, you've toured Europe. That's amazing, how was that? RW: It was pretty cool. We went over for about a month, a little over a month with a company called "Surfing Airline Productions" they're based out of Belgium. We played Holland, Belgium and the Netherlands, several cities in each. It was awesome, we had a good time. We're going back over in February. FT: You'll have a new album to promote at that time right? AW: We're hoping that we'll have a new album out. FT: Can you tell us what albums you have out now? RW: Yeah. We had a five song LP that we put out, we just put out 'Rocket to the Moon' late last year and we're working on this new album now. We're setting up a website and it'll be available on that with all our albums and merch. FT: Can you tell me about the song 'Stagecoach' and how it became included in the Viva Las Vegas 15 CD Compilation, an honor reserved for only 26 bands? RW: We got an email before the event asking if we could submit two songs and they'd pick a song if they felt that it would be appropriate for the CD. We picked two songs out for them, and sent them, and after Viva they presented to us that we'd be on the album. FT: Congratulations. Is the song that was chosen, Stagecoach, original? RW: Yes. Everything that we've recorded and done on albums is all original material except 'Walking in the Sand' (by George “Shadow Morton” of the Shangrilas). FT: Who's involved in the writing? Aerial are you involved in the writing? AW: Mainly Raffe and Tory will figure it out and then I will give input, but we all write together. RW: All three of us. FT: I love the song Oppa. the beginning of Oppa and we wrote it in like ten minutes. It's fun. FT: Your vocals are amazing Aerial, and they remind me of the female singer Exene of the band "X" at times. It's nice to have a female in this genre, because there's not a lot of them. Does having a female drummer in the band as gorgeous as yourself get the band extra attention? FT: You've experienced so much success over this last year, can you tell us one highlight out of that for each of you? RW: Mine would probably have to be Viva (Las Vegas 15). It was such an honor. We've only been playing in the scene -as we are right now- for almost three years. So, for us to make it to that and to be put on the (VLV15) Compilation was a huge honor. We've played shows with Wanda Jackson, Jr. Brown, and we're playing with some amazing Icons (which can't yet be mentioned) coming up in September (2012). We've played with the Misfits, Mad Sin, The Quakes, The Koffin Kats, CreepShow, and Big Sandy. We're playing with really big acts and really filling in our career, so hopefully we can keep it up. FT: Aerial what about you? This last year sounds like it's been a whirlwind. AW: Mine would have to be Europe. It's not really like a job to be paid and be there with my family, it was amazing. be receiving his Gretsch guitar. He's now playing with a Gretsch guitar. He's got two, a White Falcon and a Chet Atkins. The sound is amazing. He's worked hard for them. We're not sponsored by Gretsch but one of the representative of Gretsch is giving us a helping hand. We can't say we're Gretsch endorsed, but they're helping us. FT: With regards to equipment, do you use old or new? AW: I play a 1955 Slinger, and I also have a newer drum set that I play. RW: I play -it's an older Bass- the Bass that the original bass player of Bill Haley and the Comets played. It's called a "German Tank". 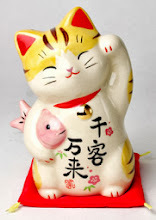 I also play a Victory, it's a Chinese-made bass. FT: Is it considered a Double-Bass? RW: Yeah, it's a Double-Bass, I play a 3/4 size, but it's a full size Double-Bass. FT: I really look forward to the new album. Who's producing the album, and what label are you on? RW: We are not signed to any label as of right now. We're looking at three different studios to record the next one at. I think we'll probably end up recording a song at each place, maybe the same song to see if we get the sound we really want. The last one [album] had a good sound, but it wasn't exactly the sound we wanted. So, hopefully this one has a little bit more punch to it. spot' for me? How do you describe what you do? RW: I don't know Frankie, we call ourselves Rockabilly. 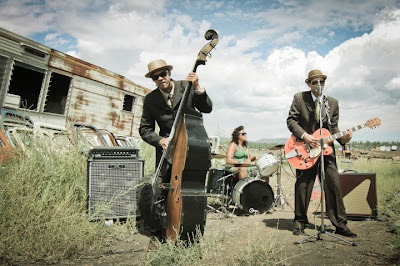 I wouldn't say we're a traditional Rockabilly band, we're definitely influenced by it. But if you listen to the albums there is some Psychobilly stuff on there, we've got Honky Tonk, original Rockabilly, and we have a lot of Polka influence. We kind of play what we feel like playing at the time, and we make it our own. Like the song 'Hobgobble' for instance, that's a really funny song. It's a comedic song.